This MATLAB (©1994-2005 The MathWorks, Inc.) code mathematically simulates bedforms and cross-bedding. The bedform program can be used experimentally to create cross-bedding produced by bedforms with a known morphology and behavior or can be used by trial and error to recreate the morphology and behavior of bedforms that produced specific deposits. Examples of the modeling, comparison with real structures, and results of computer experiments are discussed by Rubin (1987) in Cross-Bedding, Bedforms, and Paleocurrents. This documentation describes the use of the bedform program but assumes that the user is familiar with MATLAB. Included are five script files (M-Files) and one data file (MAT-File) necessary to run the program: NewDunes.m, DuneInit.m, DuneTopo.m, sandsurface.m, moviemaker.m, and sandpic5.mat. The user only needs to run NewDunes.m for full program functionality, but the other files must be in the same working directory or on the same MATLAB path. Input files that can be used to reproduce the illustrations published by Rubin (1987) are included and also need to be in the same working directory as the files listed above. The bedform program is written in MATLAB. 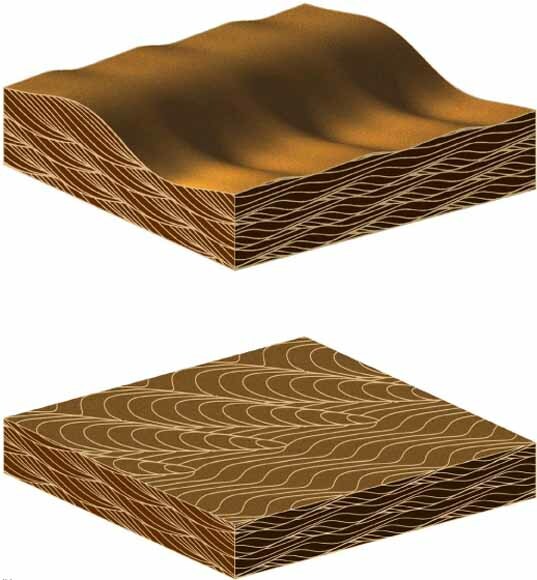 The program generates bedform topography, computes the x-y-z coordinates of the surface, and converts the three-dimensional coordinates of the simulated structures to the corresponding two-dimensional coordinates on the page, and covers the topography with a sandy surface. The program uses sine curves to create surfaces that approximate the shape of bedforms. Displacement of the sine curves simulates bedform migration, changing amplitude simulates changing bedform height, and combining sets of sine curves simulates superpositioning of bedforms. The equations that generate these mathematical surfaces can be inspected in the program source code, but such inspection is not necessary to run the program. The program can be used to produce block diagrams that display vertical sections through cross-bedding, sandy surfaces of bedform topography, horizontal sections through the bedforms, and horizontal sections through the underlying strata. Sequences of images can be animated with QuickTime (©1991-2004 Apple Computer, Inc.) to illustrate bedform behavior.